If you are planning a Minneapolis bachelor party and want to show the groom a great time, call Action Packed Paintball at (952) 492-6776 today. 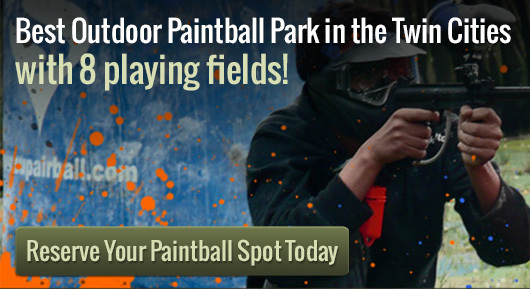 You can reserve a paintball field for parties from 2 people and up to 150. Not only will you have access to the playing fields but you can play as long as you like until the sun goes down. When you make a reservation for a Minneapolis bachelor party at Action Packed Paintball your group will get a private party host. The host will make sure they explain the rules of the game to your party and will act as the referee during your game. This is an accommodation that is great for groups with beginners and experienced players alike. Action Packed Paintball also offers rentals to players and parties. If the people in your bachelor party need equipment rentals we also offer upgrades! When planning your Minneapolis bachelor party make sure you call Action Packed Paintball at (952) 492-6676 at least one week in advanced to make reservations. This will ensure that we can accommodate your party and be able to give you best time possible. We offer private parties 7 days a week from sun up to sun down, so call and make your reservation today!